With a long line of World cup winning heritage behind it, the Orange 324 is a downhill weapon of choice. Using our experience with the 22X/32X series of downhill bikes, the Orange 324 is the refined result of prototype feedback we've received from the team and plenty of the frame's features redesigned. Most notably taking the chassis to the 27.5 inch wheel size. We've retained the through-the-downtube shock mount. This is a feature gives us the scope to place the single-pivot exactly where it needs to be in relation to the drive-train to achieve the kind of small bump performance and plush feel that most people would expect from much more complicated linkage and multi-pivot designs. In addition it means the frame's 'shock curve' is a smooth ramp. This feature allows for easy shock set-up, something that should be simple but is often hampered by variable paths. With the Orange 324 the suspension tuning is done with the suspension unit, keeping this simple is perfect for privateers who may not have a race support truck with a full-time shock technician for every track. 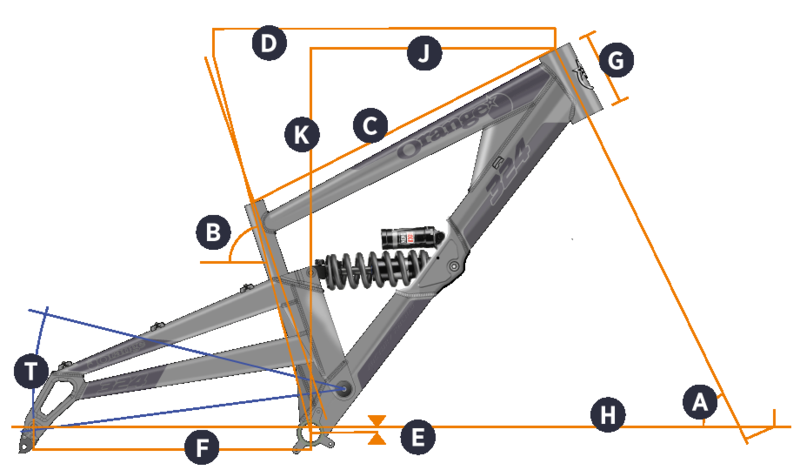 The Orange 324 uses the split-rear triangle swingarm concept reducing weight and increases rigidity. Additionally we’ve added stability with the a wider 83mm bottom bracket and 150mm rear wheel spacing, minimised tortional twist which helps keep the rider on their line. One of the major advantages of designing for the 27.5 inch wheel size is that the bottom bracket is now lower than the axle path at rest. This head start gives the bike a much more dug in feel when pushing through turns while also keeping the centre of gravity low for high speed straight line stability. So wait that’s a lot of work and more metal right? What’s the weight penalty. Well you might be surprised to hear that size for size the Orange 324 frame comes up around 200g lighter than the 322. It's hard work keeping things simple, but we believe with the Orange 324 we've built a downhill bike that will perform at the highest level, again and again and again with the minimum amount of maintenance and the maximum amount of time on the track. Sunset Cycles offers the 2018 Orange 324 Factory downhill mountain bike with up to 36 months 0% finance and free delivery. Rider Height Guidance* 5'5" to 5'9" 5'7" to 5'11" 5'9" to 6'4"
Seat tube length 15" 15" 15" 17"